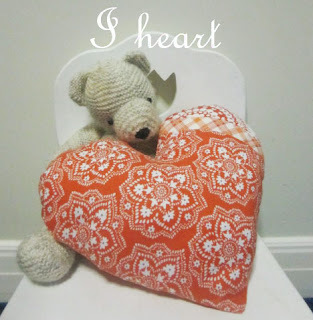 This sweet heart shaped cushion was inspired by my sister Jac - a fellow sewer and crafter. I felt Isabella was in need of her signature cushion and I was right...it now comes to bed with her along with her faithful Minnie. I made an inner casing which I stuffed with polyfill then made a separate heart shaped pillow case and left an opening which has an invisible zip to close. Heart pictured here with Isabella's knitted bear I made her when she was a bub - a pattern by Debbie Bliss. These heart cushions make a great gift for little girls - just the right size for good winter cuddles! I can see that lovely cushion is going to be well loved - together with the gorgeous bear! How very talented you are! Too gorgeous! I think kids love having something made specially for them that they can snuggle with. Also love your other creations featured on your blog!